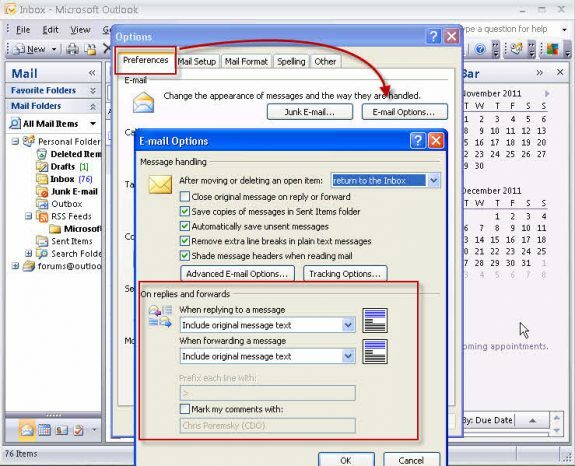 The default setting in current versions of Outlook in no quoting, no indentation. This can be changed to use a quote prefix, indent quoted messages, or attach quoted messages. We do not recommend using the Indent or Attach options. Note that the quote prefix character (usually ">") is applied only to plain text messages. When you enable this option and reply to an HTML message, the quoted message is prefaced with a blue line. In the Replies and forwards section (about halfway down the dialog), choose Prefix each line of the original message. Enter the desired prefix character in the Preface each line in a plain text message with: field. We highly recommend using > as the character as its the commonly accepted quote-prefix. Choose Tools | Options. On the Preferences tab, click E-mail Options. 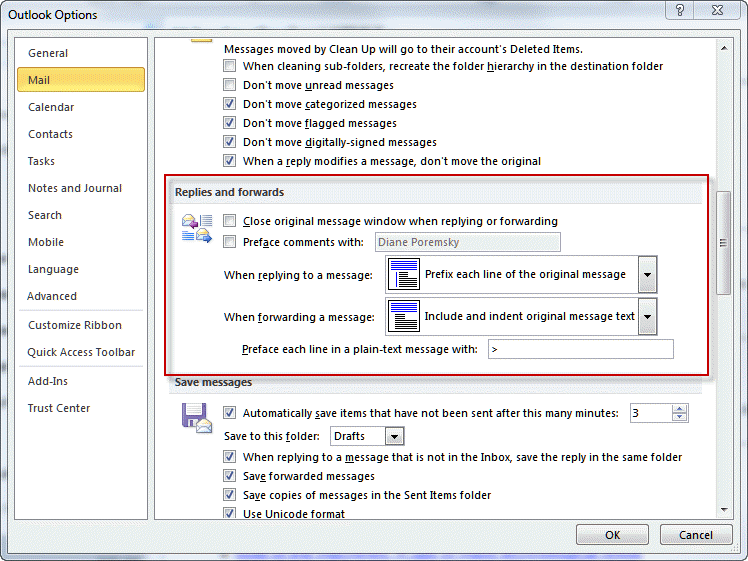 Under When replying to a message and When forwarding a message, choose Prefix each line of the original message. Set the prefix character(s) under Prefix each line with. 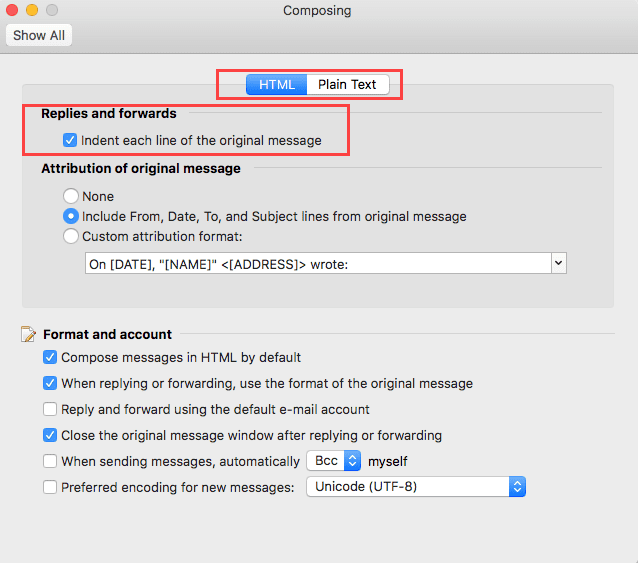 Outlook for Mac doesn't support changing the reply format to include line prefixes. The only option is to indent or not (with separate options for HTML or plain text message format). Unlike Outlook for Windows, you can change the reply header format. 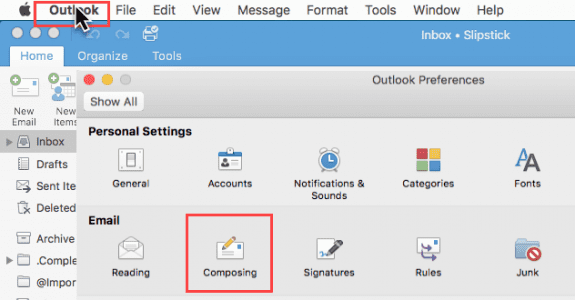 To access the options in Outlook for Mac, click on Outlook in the top bar and choose Preferences from the menu then click Composing. The only reply format option is to indent the original message (or not). This setting can be different for HTML and plain text messages. Outlook for Mac users also have the option to customize the reply header block. Cleans up plain text replies and forwards by tightening the quoting characters, allowing you to specify the quote header, and moving the cursor to the bottom of the message. Beta. Free. How can I make this work in Mac Outlook 2016? These option are not present there. Outlook for Mac lacks many of the options that Outlook for windows has... the closest it comes to this is in Outlook > Preferences > Composing - you can set it to indent the lines (but not add carets >) and change the reply header. Thanks for the article Diane... It is annoying that Outlook won't let you choose to prefix HTML messages with the > character rather than the line. As an aside, this is the first time I've heard > referred to as a caret... wherever I've worked (Europe, Australia and NZ) a 'caret' has always been ^ and > and < have always been 'greater than' and 'less than' symbols. What do you call the ^ character? you are correct - its not really a caret, but its less typing :) less than or angle bracket would be the proper term. I clearly wasn't thinking when i typed it. Is there any way (possibly using VBA) of coloring different level of quotations when receiving plain text messages? No, the editor doesn't support that in plain text messages. Anyone know how to do this with webmail? In OWA or other email read in a browser? You are limited to what the server's mail application provides. I'm not aware of any way to change it. I'm not aware of any browser extensions that could change it either, but that might be worth looking into. How can I change these properties using VBA? The settings in Options are stored in the registry. You can either use a reg file or set it using vba. read-and-change-a-registry-key-using-vba has code to read, change, delete, and add keys & values. Wrong instructions for Outlook 2007. In the Options tab there is no such thing as Preferences tab and email options. Will search the Internet for better information.